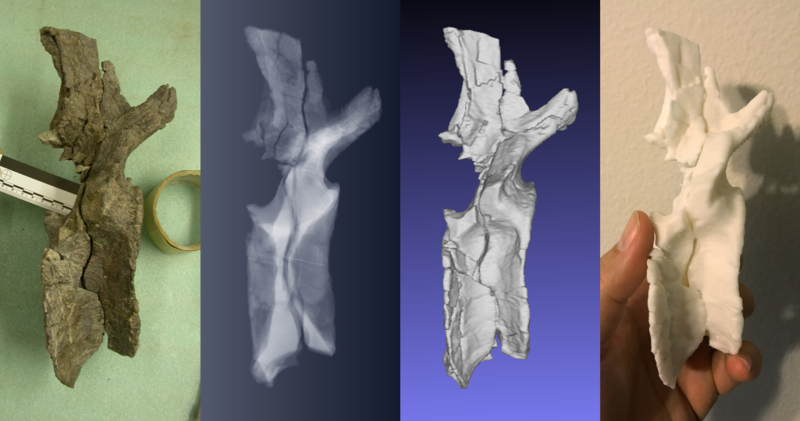 The most complete caudal vertebra of the Snowmass Haplocanthosaurus (Foster and Wedel 2014) in right lateral view: specimen photo, CT scout, 3D model, 3D print at 50% scale. The photos of the specimen and the 3D print probably match the worst with the others, because they are subject to perspective distortions that the digital reconstructions are free from. Here’s one nice thing about having a 3D print of a specimen that you’re working on: you can hand it to other anatomists and paleontologists and get their take on its weird features, and it’s small enough and light enough that you can bring it halfway across the country to show in person to an entirely different set of colleagues. For all that we hear about humans being a visual species, we are also a tactile one, and in my admittedly limited experience, grokking morphology by handling 3D printed fossils is almost as good as – and for big, heavy, fragile sauropod vertebrae, sometimes better than – handling the real thing. Many thanks to Julia McHugh at Dinosaur Journey for access to the specimen, John Yasmer at the Hemet Valley Medical Center for CT scanning, Thierra Nalley at Western University of Health Sciences for help with segmenting and visualization in Amira, and Gary Wisser, WesternU’s 3D visualization specialist, for the sweet print. Further bulletins as events warrant. Ugh, I need a 3D printer real bad. Actually, you would do better off not buying a 3D printer, but finding a local company via Google to print your 3D files. I looked into buying one for the museum here using the parameters: cost of printer & printing material vs cost of 3D print vs how often we would need a 3D print vs pace of technology change. It was better to have someone else print at this time. A 7 ft juvenile Allosaurus cost only $2,500 USD.